for the contemporary austin, south korean artist do ho suh renders a multipart installation, extending his devotion to such themes of global identity, public versus private space, memory, and displacement. a combination of existing work with newly commissioned aspects infill the museum’s jones center and laguna gloria, comprising architectural structures, documentary films, drawings and related models. 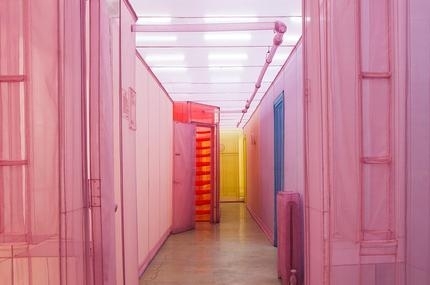 at the exhibit’s centerpiece — presented from now until january 11th, 2015 — is a collection of rooms and passageways from suh’s 348 west 22nd street apartment complex in new york city. the final unit has been created and shown for the first time on the occasion of the exhibition in texas, representing closure for the series he began in 2011.